Tecno L9 Plus is the successor of Tecno L8 Plus and it is among the latest smartphones from Tecno Mobile. On the other hand, Infinix S2 succeeds Infinix Hot S, and it is slightly a stripped down version of S2 Pro – the difference is just in the RAM and ROM. You can check out full comparison between S2 and S2 Pro here. Both devices (Tecno L9 Plus and Infinix S2) are great and unique in their own aspects. The Tecno L9 Plus fall into the phablet category with 6.0-inch IPS display and a screen resolution of 720 x 1280 pixels. The L9 Plus comes with a power house battery of 5000mAh, which Tecno claims can give you up to 72 hours on a single charge under heavy usage. On the other hand, The Infinix S2 is a compact device with 5.2-inch screen. It feature the same screen resolution as the L9 Plus. And of course, being smaller means it has more pixels per inch (244 ppi for Tecno L9 Plus and 282 ppi for Infinix S2), which technically means it has a better display. Ya, but that’s only technically. On the battery side, the S2 X522 comes with 3000mAh battery. That is significantly lower than that of L9 Plus but you can expect a decent performance with that. Tecno L9 Plus comes with Android 7.0 Nougat out of the box, while the Infinix S2 comes with Android 6.0 Marshmallow, but it is currently receiving Android 7.0 update. The key advantage the S2 has over L9 Plus is the camera. Not the back camera though because both feature 13MP back camera. The Infinix S2 comes with dual front camera (13MP + 8MP), which puts it as a wefie (group selfie) smartphone. What that means is that you can easily use it to capture group selfie without the need for a selfie stick, thanks to the 135 degree camera. Tenco L9 Plus on the other hand, comes with 5MP front facing camera which is decent for selfie. Ya, decent is all you got. Both devices comes with MTK processors 2 GB RAM, and 16 GB internal storage which is expandable to up to 128 GB with external micro SD cards. Like we already said, both devices are great. Choosing between the two boils down to a matter of personal preference. If you like it bigger, then Tecno L9 Plus is for you. If you like it smaller, well, you know the one you should go for. If selfie or wefie is a priority for you, then Infinix S2 is definitely the choice. Check out the full specs comparison of the two devices in the table below. 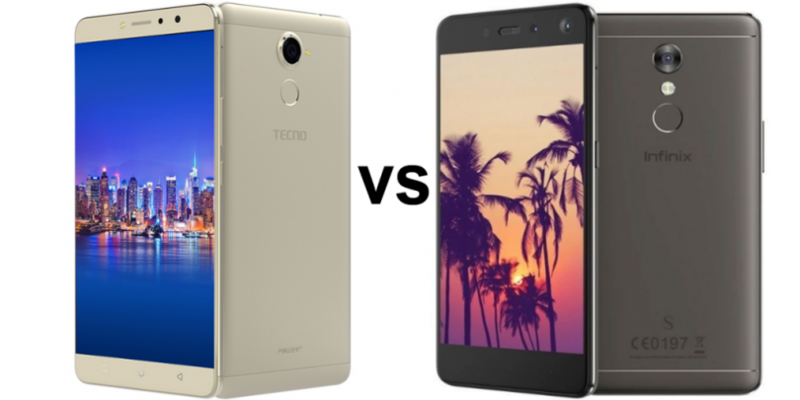 Gionee M5 Mini (Lite) vs Tecno boom J8 vs Oukitel K4000 pro.